Harry’s Cosmeticology, one of the most popular cosmetic technical books of all time, has been updated by Dr. Martin M. Rieger, together with an international team of experts in different areas of the cosmetic science. The 8th Edition of this book, regarded as an essential reference for cosmetic chemists, cosmetic dermatologists and plastic surgeons, is structured to provide a overall understanding of the most current formulation and production processes in the cosmetic industry. 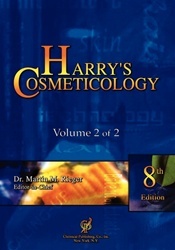 The chapters on skin, hair and nails anatomy and physiology provide the foundations for cosmetic formulation approaches and methods analyzed in the chapters on Special Ingredients, Processes, Formulation, Performance and Production.